When is it too early to start shopping for Christmas decorations? The answer – never! And certainly not in mid-November, when you are counting down days to the big day. If you haven’t already heard of them, The Christmas Boutique is a gorgeous on-line shop for all your festive decorative needs. They have a huge collection of beautiful Christmas ornaments from garlands and wreaths to advent calendars to home and tree decorations. I was delighted when they sent me a boxful of some of their pretty items to review. First up were a set of two natural linen Christmas stockings that retail for £14.99 and a set of natural linen gift bags for £9.99. They are a pleasant break away from the more traditional red that we always associate with Christmas. 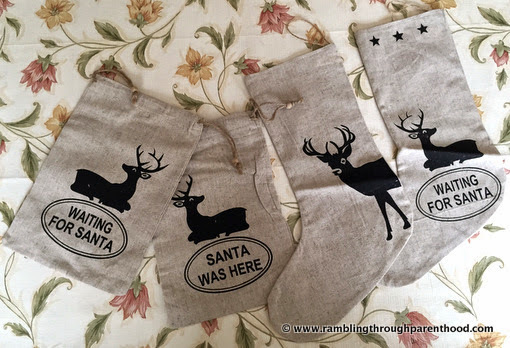 Made with natural fabric, they have a stag and deer print with black lettering that creates a more subtle and rather rustic Christmas feel. If you are looking for something a bit more grown-up, these are definitely worth a look. 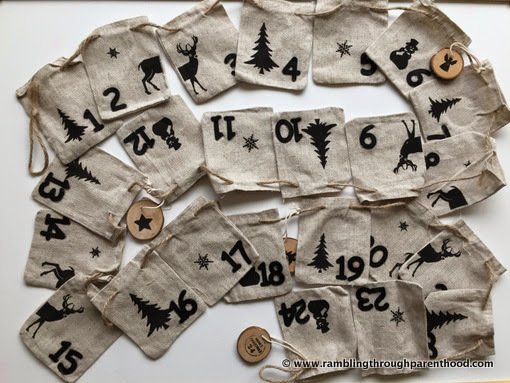 The linen pocket washing line Advent calendar is along similar lines. It is made of natural linen on a jute string and has bold black felt numbers and Christmas themed pictures sewn on for added effect. It is quite a long calendar, stretching over 8 feet, but if space is not an issue, it will certainly add an earthly charm to your Christmas. The pockets are spacious enough to house any amount of chocolate you care to put in. Always a bonus in my opinion. 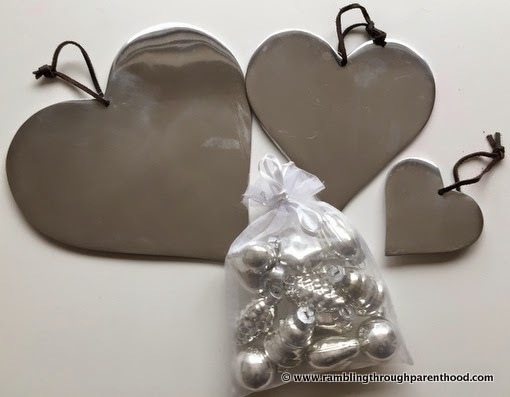 I was also sent a set of three aluminium hanging hearts. They came nicely packed, but I was a bit concerned to find a few scratches and scuff marks on the surface. When I contacted The Christmas Boutique about this, they were very prompt and helpful with their reply. I was informed that due to the way they are manufactured and the material used they would have some slight blemishes and marks on them. A totally perfect finish was not possible. Fair enough. 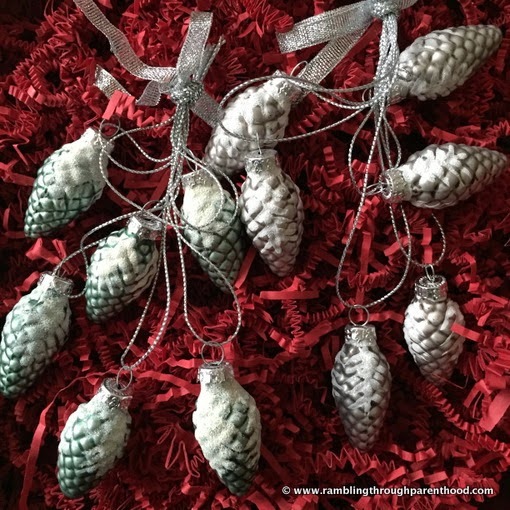 The set of twelve silver finish glass baubles and the pair of frosty pine cone bundles were the daintiest of the lot. And extremely delicate too, as I realised after smashing one of the little bell-shaped baubles. They are made of glass, so I should have known better and been more careful when handling them. Nevertheless, they are beautifully finished with good attention to detail. 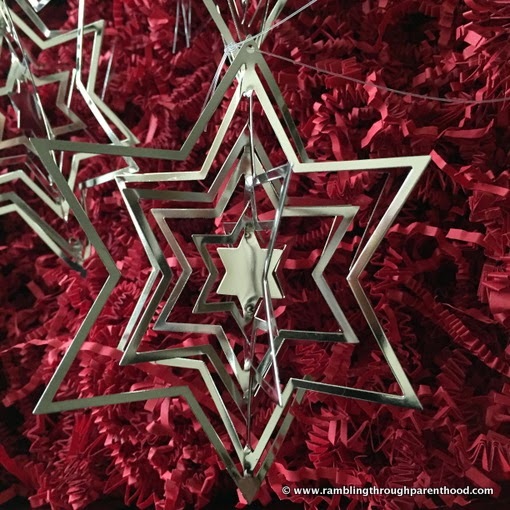 My favourite of all the items was a set of three silver metal hanging star decorations. They are three dimensional intertwining stars that rotate on a pivot and catch the light as they do. The effect is spectacular. Overall, I am very pleased with the range of items I was sent to review by The Christmas Boutique. Everything was delivered on time, the packaging was secure and the quality of products was good. The Christmas Boutique stock a wide range of items to suit all tastes and all pockets, so you are sure to find something to make your Christmas special. I am hoping to pick up a couple of things from them myself. The Christmas Boutique has kindly offered to give my readers a 10% discount on their purchases (excluding sale items). Just pop in the code ‘LOVE33’ at checkout. They also offer free standard delivery for the UK. Happy shopping! Disclaimer: I was sent a selection of Christmas decorations for the purpose of this review. All opinions are my own. There are some lovely things at Christmas Boutique, and so easy shopping online. lovely! They have some great stuff in stock don't htey?! Wow, I really love the advent bunting. Looks like some lovely Christmas products. What a gorgeous bags! I would love to have them as foodie props! Great review! Oh I could spend hours looking through all these lovely things! If there's something I've learnt as a paprent ... it is NEVER to early to start shopping for Christmas!